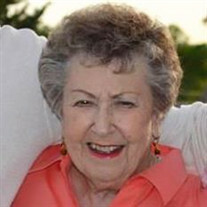 Bettye A. Kelly, 91, of Surprise, Arizona, formerly of Vandalia, Illinois, passed away Thursday, January 10, 2019, at Chaparral Winds Assisted Living in Surprise, AZ. Services will be held at 11:00 AM, Friday, January 18, 2019, at Miller Funeral Home, Vandalia, IL, with Pastor Joe Lawson, officiating. Burial will follow at Fairlawn Cemetery, Vandalia, IL. Visitation will be held from 6:00 PM to 8:00 PM, Thursday, January 17, 2019, at the funeral home. Memorials: Hospice of the West and/or Grand Community Baptist Church, Surprise, AZ. She was born April 28, 1927, in Rural Vandalia, IL, the daughter of Lawrence & Ina Katherine (Blankenship) Reising. Married Freddie Everette Hamilton July 16, 1948, Mayfield, KY, he passed away October 8, 1987; later married Rex Kelly, May 17, 1997, Vandalia, Illinois, he passed away November 9, 2006. Bettye was a County Office Assistant at Farmer's Home Administration for 21 years and Mary Kay Consultant for 25 years, both Vandalia, Illinois; Member of Grand Community Baptist Church, Surprise, AZ; former active member of the First Baptist Church; Soroptimist Club, Fayette County Hospital Auxiliary, all Vandalia, IL. and National Retired Federal Employees. For the past 4 years, Bettye had been a resident of Arizona, residing in Chaparral Winds Independent & Assisted Living, Surprise, AZ. These were some of the happiest in her life, as she was very involved in her church. She enjoyed the amenities and activities offered by Chaparral Winds, such as cards, bingo, concerts, day trips, shopping, movies and other various forms of entertainment. She cherished her many close friends there. Bettye is survived by: Son - Jeff Hamilton & Maria Fiore, Bloomington, IL and Cape Coral, FL; Daughter - Marsha Paddock & Roger, Waddell, AZ; Twin Granddaughters - Lisa Lexow, Clearfield, UT and Monica Ayers & Randy, Fort Hood, TX; Great Grandsons - Nathan & Lucas Lexow, Clearfield, UT; Nephews - James Myers, Gary Grigg & LuAnne, Lindell Grigg & Joyce; Nieces - Brenda Shippy & Rolland and Connie Newby & Loy. Preceded in death by: Parents; Husbands; and 2 sisters - LaVon Myers and Beulah Grigg.